Have you noticed how early the sun is setting? Do you know who else is noticing paying attention to the loss of daylight? Hummingbirds! It is believed that the length of daylight is the most important factor in determining when Hummingbirds migrate. When days get shorter Hummingbirds instinctively eat more nectar and insects in preparation to their exhausting flight back to their wintering grounds in Mexico, Central and South America. To our tiny winged friends, food is energy and they’ll actually need to almost double their body weight daily to support migration. So, yes Hummingbirds are making more frequent trips to our nectar feeders. You may also be getting longer views of them as they remain drinking for greater periods of time. Some Hummingbirds begin to migrate in early August, but most don’t begin their journey until late August or September. Just as male Hummingbirds are the first to migrate north in the spring, they are the first to head south, followed by adult females and then juveniles. Don’t worry, even as the Hummingbirds you have fed all spring and summer depart, birds that nested further north in the United States and southern Canada will appreciate your feeder and visit as they migrate through the area. 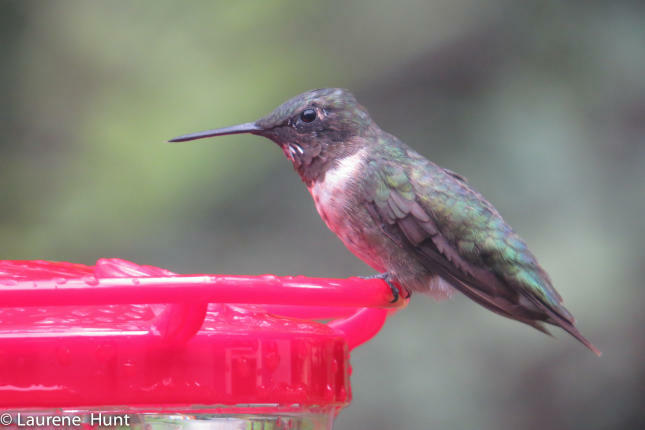 In fact, the number of Hummers visiting your feeder may increase at times because these migrating birds include immature birds hatched this summer! Hummingbirds migrate during the day and it is believed that most of their trip is spent at tree height as they continually look for food to refuel. Hummingbird migration may just be getting started in August, but it will continue through the fall. Birds hatched late in the breeding season depart later than those hatched earlier and they may still be migrating through in late October or early November. So keep your feeders cleaned and filled!